Datamax Texas is dedicated to delivering professional, reliable service and maximum performance for Konica Minolta’s award-winning lines of digital imaging products. 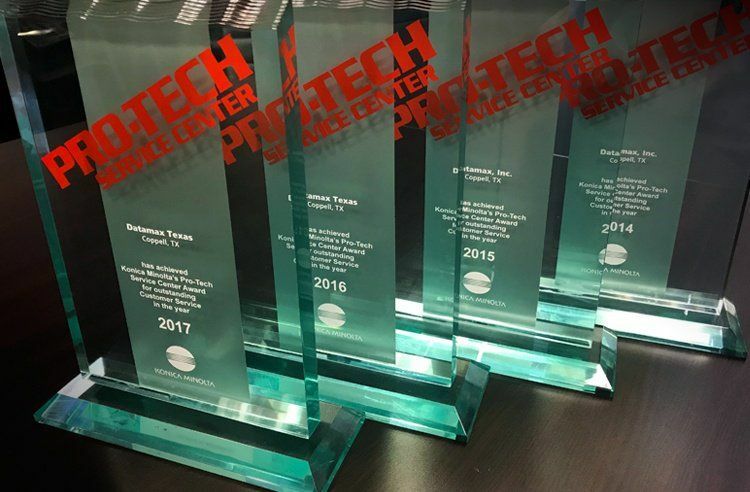 To merit the Pro-Tech standard, each element of Datamax Texas operation was evaluated, including management skills, inventory control systems, technical expertise, dispatch systems and customer satisfaction ratings. "We have always strived to be a “Class Above” in the Service area of our business. We think it is vital to our success to be the best we can be and winning this award compliments that culture. I want to thank all of our Service Personnel on all the extra hours it took to accomplish this award." says David Rhodes, President, Datamax Texas.